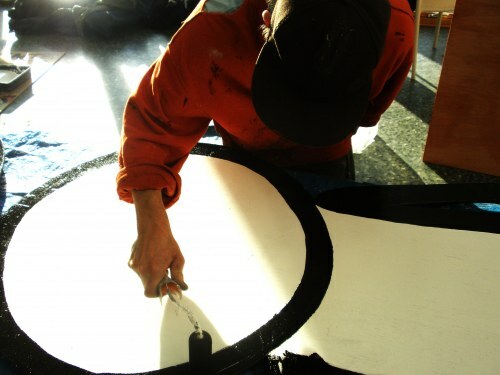 This is Stik, paint-splattered and hard at work in the Mile End Arts Pavilion on some material for his solo show back in 2010. 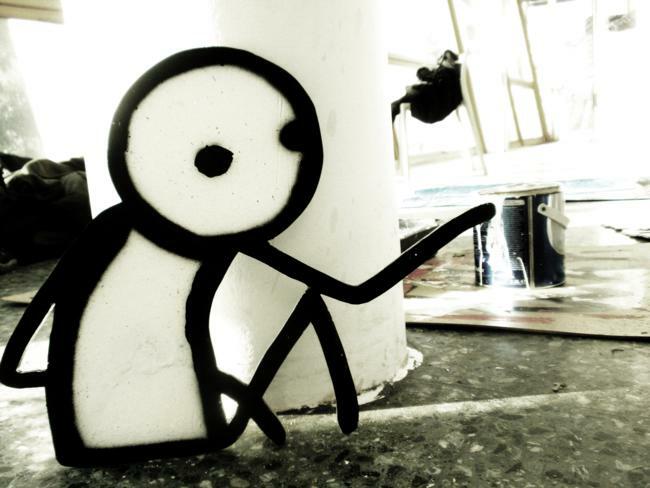 He’s been creating Stik in various forms for 10 years now. 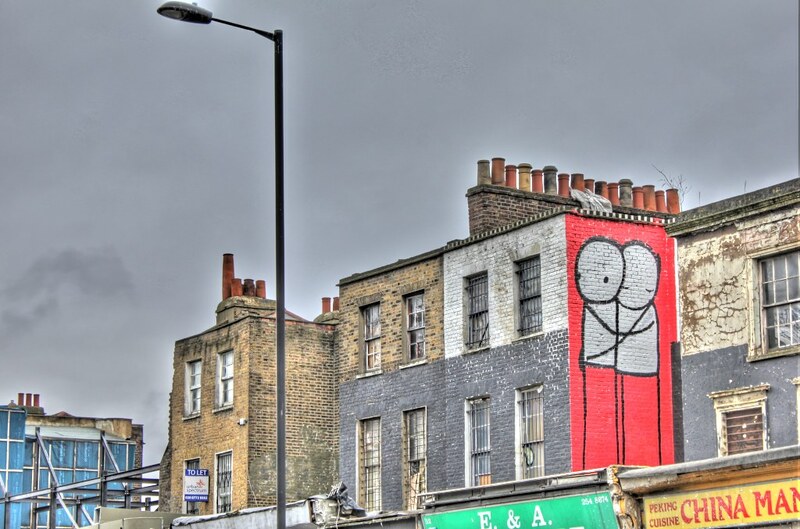 You’ll find his work mainly around Hackney Wick, Dalston and Shoreditch – Stik people resting, dancing, entire Stik families bringing life to neglected walls or empty billboards. 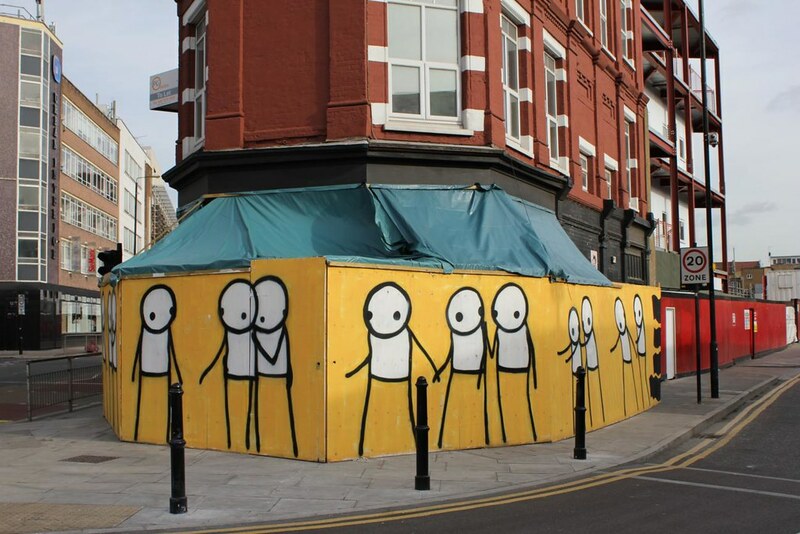 Recently, Stik’s been branching out, with people in other parts of London asking him to graffiti Stik on their walls, working at Glasto and putting up a few pieces in Bristol. He even did a campaign for British Waterways. 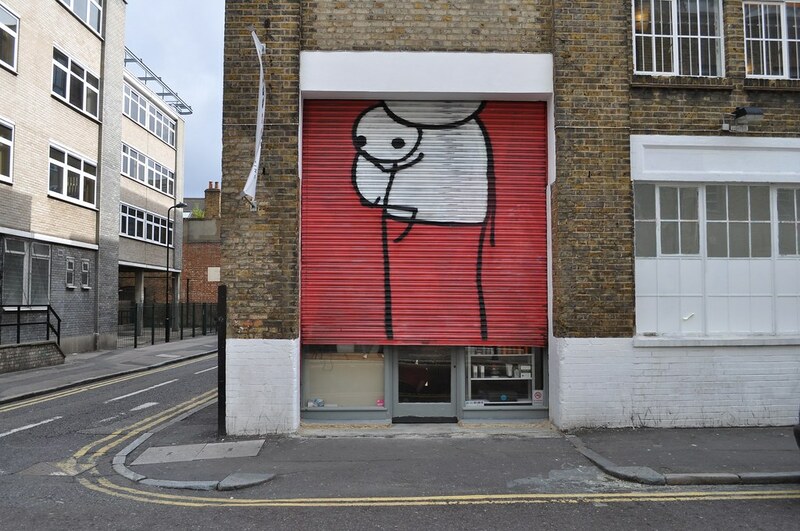 Stik tells us how his art has seen him through his toughest times on London’s streets, about the beauty of language and movement and a little story about a woman in Mayfair. 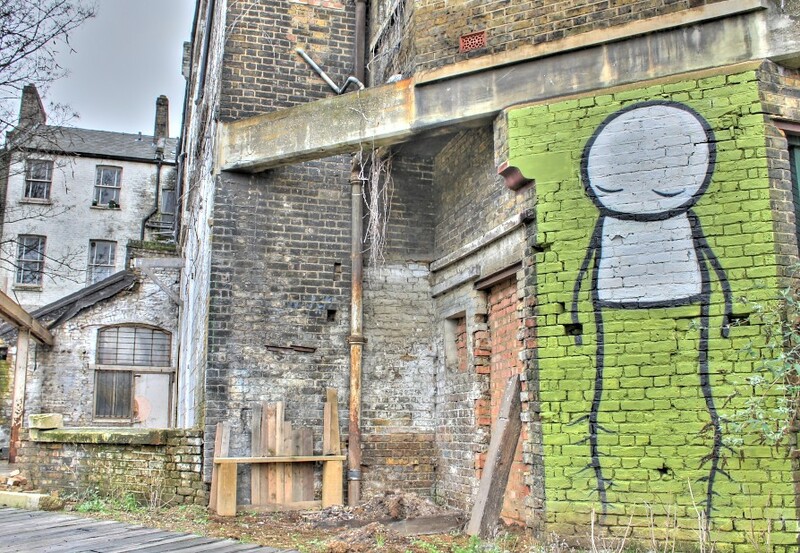 What is the significance of Stik? Quite often, simple images are the most noted. If I’ve got too many lines, I kind of lose track of what’s going on. I like to have very few things going on, but a lot of data compression in that. This arm’s got three bends in it (pointing to one of the figures he was painting) and I think about the way it conveys movement. Beauty is in movement. That’s what it’s about. Beauty is about the way that someone moves their body. You can tell by someone’s walk if they’re angry, whether they’re happy or if they’ve just eaten. You can tell a lot about someone just by the way they’re moving their back or their eyes. There doesn’t need to be a great deal of detail there. You can see it from across the road. You can see someone silhouetted against a white wall in the night and check whether they’re walking in an aggressive way or if they’re someone you know. That’s what I’m trying to capture in my work – that direct recognition. Before writing, before speech, it’s the language of toddlers, the language of cave people, body language. I think it came from trying to speak to people I don’t share a common spoken language with, just trying to find a way of conveying complex emotions without speech. Which piece are you most proud of and where can we see it? Well… the one I’m most proud of I don’t talk about because it’s illegal (laughs), but the one I’m second most proud of, I really like bits and pieces I’ve done around Ladbroke Grove under the Westway as part of the Mutate exhibition. 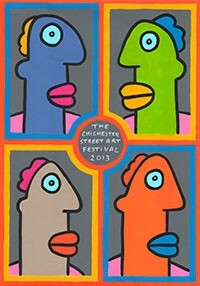 Is Stik meant to be androgynous? They are androgynous. They are what you decide they are and they can transcend gender. Recently, two articles were written about you in The Big Issue. That was through Mutate, really. I’m living in a hostel now; I was homeless for a bit. That interested me because of my own situation. 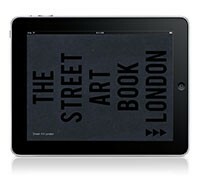 I released a 3D print through a company called Squarity, 100 little images, and dropped them in the city, stuck them up on walls around London to raise awareness for homelessness. How did you choose the other artists for the group show? I never belonged to a crew really. I wanted to find where I connect to other graffiti artists. Something I found sourcing artists is that graffiti artists are quite often deep people. They’ve got meaning behind what they’re doing. It’s got a reputation for being quite an aggressive art form sometimes, or something a bit daring or radical. But some of the artists are just really sensitive and caring people and create pieces that are really delicate and perceptive. When I watch even some of the most aggressive writers up close, getting the line just so, cutting into the line so they get this perfect curve…they’re working with this spray paint which is a pressurised container of gas and chemicals and they’re trying to work with millimetres to get a curve just so. They work very gently and subtly and it’s quite touching. Doing this is really important. It’s an important transition for me. It’s going from being homeless and, via street art, making things more stable, a constant thing that’s been with me for a long time. It’s taken me through some really tough, dark times into the land of the living really. I’ve had an amazing time turning things around. I’ve decided this is enough to base my life on. It feels like I keep feeding it and feeding it. It’s starting to carry itself now and maybe one day it will carry me. I just want to paint all the time. I want this to be all I have to do. I want to do this because it fulfils me. It’s hard. I put every ounce of energy into it. I wake up in the morning and think okay, what can I do now? To my friends, I’m obsessed with it, but it takes a certain amount of obsession to get anywhere in this world, I think. If you’re half-hearted, people overlook you. People overlook you if you’re obsessed as well, but you just have to keep soldiering on and eventually people will go, “Hold on, that person’s got something to say; let’s listen.” Each piece is its own piece. It’s creating a thought in public consciousness, trying to say something. It’s free art. It’s for everyone. Interview by Stephanie Sadler. 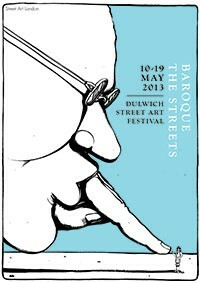 Originally featured on Little London Observationalist.